NEW BRITAIN - Football film doesn’t lie. That’s the approach the Central Connecticut State football team is taking into today’s meeting with Wagner (2-5, 1-1 Northeast Conference). On paper, the Seahawks appear to be one of the weaker teams in the conference, both also one whose talent has been evident against a number of quality opponents. Wagner snapped a five-game losing streak two weeks ago against St. Francis (Pa) after scoring the go-ahead touchdown on an 18-yard pass from D’Erren Wilson to Chris Woodard with six seconds left. Before that, the Seahawks held a late lead against Monmouth before surrendering three touchdowns over the final 10 minutes of play. Rossomando wants his team to continue to have a one-game focus, particularly with CCSU (4-4, 2-1) still in the mix for a potential repeat of the NEC title. 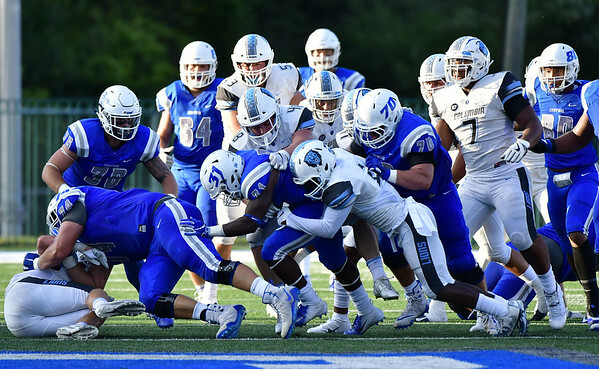 After last week’s loss to Sacred Heart, a victory could keep the Blue Devils jumbled up at the top with Bryant and Duquesne depending on how those program’s games play out today. Bryant and Sacred Heart kick off an hour after CCSU, while the Dukes have a bye week. That focus is going to be necessary on Saturday, especially on defense. The Blue Devils gave up 21 second-half points last week and will be up against Ryan Fulse, the FCS’ leading rushing. Through seven games this season, the Seahawks senior tailback has run for 1,030 yards (147.1 yards per game) and six touchdowns on 181 carries (5.7 yards per carry). On the season, CCSU is giving up an average of 142.3 yards on the ground. Wagner’s passing game, on the other hand, has been inconsistent at best. The Seahawks employ a two-quarterback system with T.J. Linta, a graduate transfer from Brown University, and Luke Massei. Linta (770 passing yards, 7 touchdowns, 2 interceptions) is most likely to get the start today and is more of the drop-back passer of the two, while Massei (511 yards, 4 touchdowns, 6 interceptions) tends to operate better out of the spread. Massei threw for 322 yards and three touchdowns against CCSU last season. But just as important as it will be for the Blue Devils to fill in their gaps on defense to make Wagner throw the ball more will be the need for the players to stick to their respected assignments. Offensively, CCSU is going up against a defense that has given up its fair share of points this season. Opponents haven’t scored fewer than 22 in a game against Wagner, which happened to be against St. Francis. Overall, the Seahawks give up an average of 42.6 points per game. But Rossomando knows those numbers are a bit inflated, considering the teams Wagner has faced through the first seven weeks. The upcoming forecast might not work in the Blue Devils’ favor either, especially for a team that likes to try and stretch the field with a number of go routes down the sidelines. Of course, as CCSU knows going into today’s game, the tape doesn’t lie. Posted in Newington Town Crier, CCSU on Friday, 26 October 2018 22:26. Updated: Friday, 26 October 2018 22:29.